It always makes me a little melancholy when I realize that the Ruby-throated Hummingbirds have left here on their annual fall migration to southern Mexico, Central America, and even as far away as South America. The red glass feeder with the little plastic flowers hangs out there abandoned now. Those tiny birds become such a part of my daily gardening life while they are here that I've truly come to miss them when they leave this part o f the world for points south, usually sometime in September. I realize that the ones I have been seeing at my feeders since then are most likely other hummers that are migrating through from farther north. I still call them mine because I know that some of them stop by here every year looking for the food sources they remember from their past migrations. 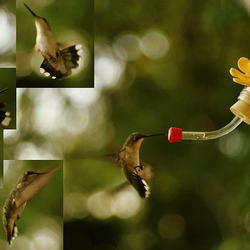 One thing about hummingbirds, they have great memories. So I always leave the feeders out for them until the nectar starts to freeze in the bottles even though I don't recall ever seeing a hummer here after mid-October. It's important to make sure any late-season stragglers are well fed though. The Ruby-throats are more sensitive to cold than some of the species and don't enter torpor to conserve energy as easily as do their western counterparts. I always try to provide something for those few stragglers should they appear. They won't forget that. 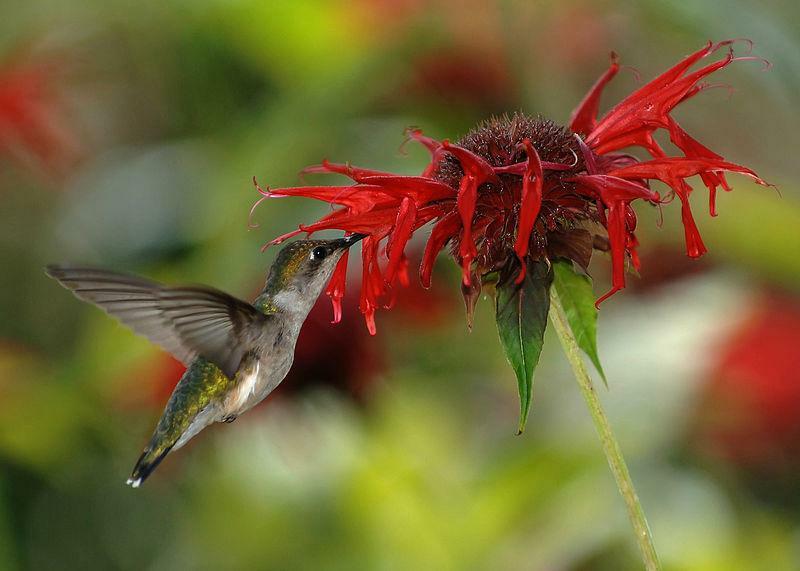 Once a hummingbird learns a route, it will most likely retrace that route every year of its life searching for the same food sources in the same places as it goes. My little shimmering "flying jewels" know it's time to go when the length of hours of sunlight diminishes with the approach of autumn. Their trip has nothing to do with temperature or lack of food. In fact, many begin to migrate around the time that food sources are most abundant. When a hummer is fat enough, it will migrate. It is thought that the males go first, but I have found little scientific research to support the theory. That said, the males do tend to be seen arriving back here in the States ahead of the females when it comes time to fly north ag ain. I suppose I grow melancholy because I tend to worry a bit about "my" birds during the migration. After all, it's a one-way trip of 2000 miles or more including a usually unavoidable 500 miles of non-stop flight over the Gulf of Mexico. Scientists marvel at that. So do I. My fondest hope is that they all make it back here next year, and it saddens me to think that some probably won't. They are such tiny and tenacious creatures on a long, difficult journey fraught with so many perils along the way. 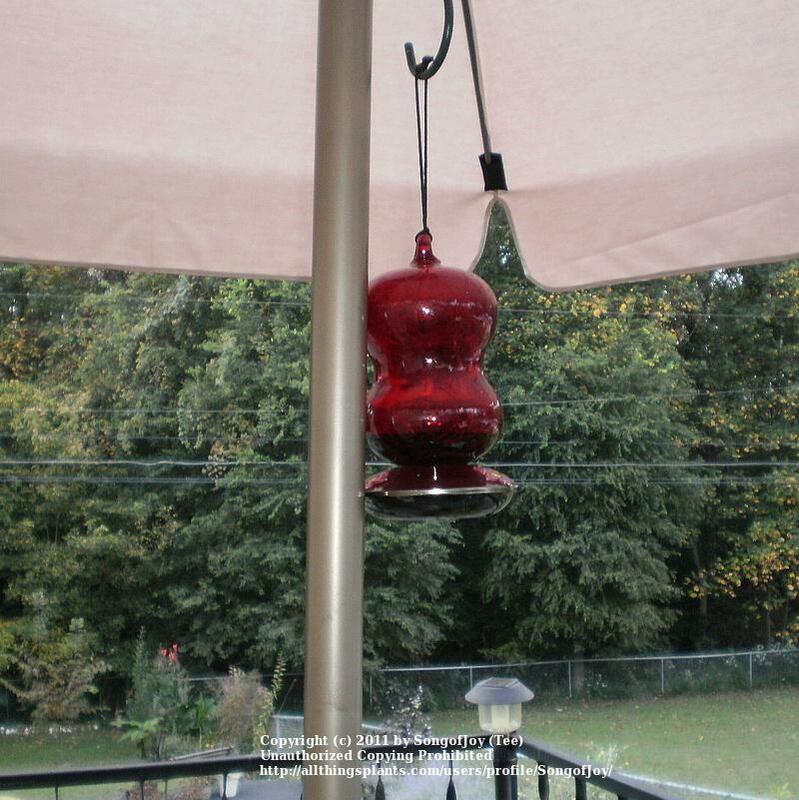 Anyone who has witnessed the antics of hummingbirds defending their favorite feeders knows they have great evasive flight maneuvers. This serves them well on the migration. They can move quickly in just about any direction in order to avoid or intimidate a preceived threat. Both males and females defend their territories, and it always seems to me as if all that fuss over territory is a colossal waste of energy just when they are about to need it most. To them, though, it means survival. 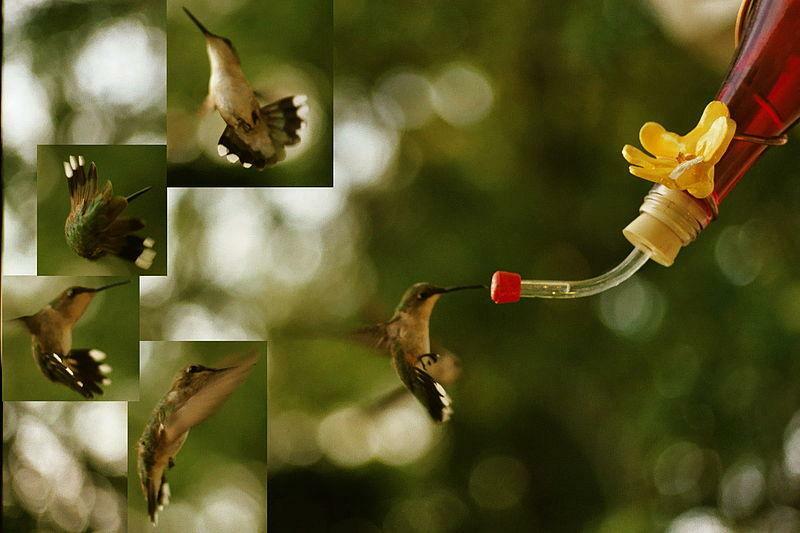 Although they are carnivores, that simple sugar-water nectar is the fuel that powers their insect hunting activities. The nearer it gets to migration, the more territorial they become as they require more and more food in order to fatten themselves for the long, arduous journey ahead. Hummers usually double their weight during this time. 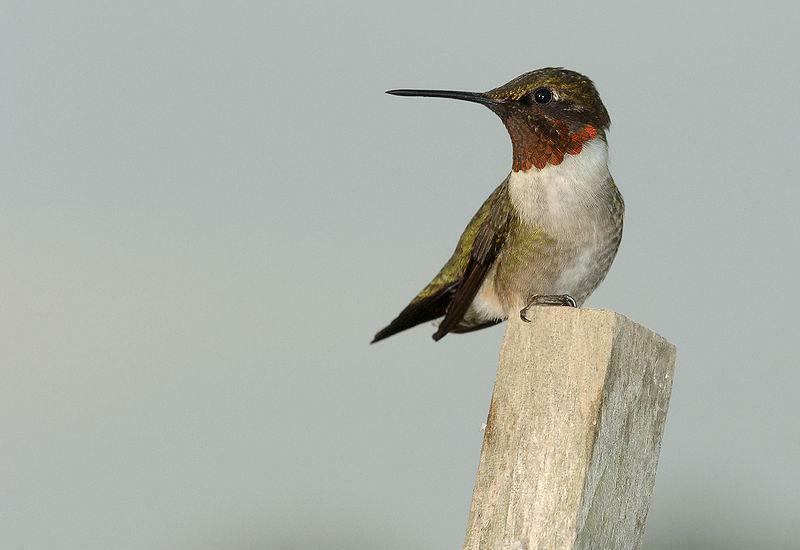 The Ruby-throats mostly over-winter in the area from southern Mexico to northern Panama. A few that are too old, too debilitated, or too young to make the migration will stay along the Gulf Coast where they can survive if the winter is not unusually cold. A smaller number spend the winter in the Outer Banks of North Carolina. 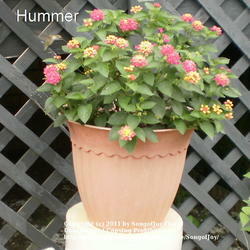 In my garden, the hummingbirds provide many benefits besi des the endless entertainment. They are important pollinators. 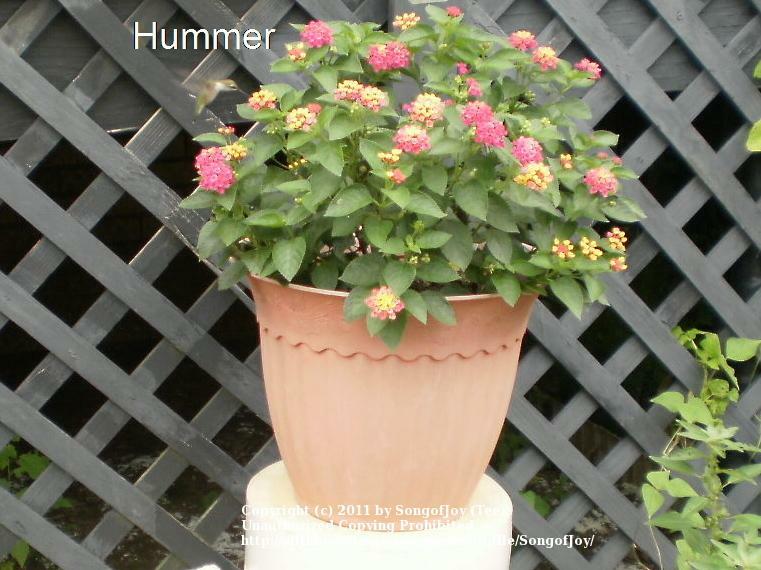 As they feed, their heads rub against the stamens and pistils of flowers and collect pollen. They then move from blossom to blossom, pollinating as they go in much the same way as bees do. They are also very useful as a form of organic pest control. 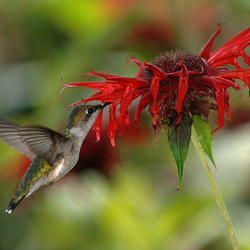 Hummers eat mosquitoes, gnats, ants, aphids, white flies, midges and other soft-bodied insects as well as insect eggs. As they move about my garden, they are definitely doing more than just sipping nectar from the flowers there. 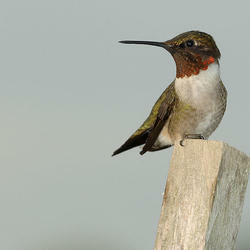 In January or February, Ruby-throats reverse direction and begin their return migration north along the same route. This will take place over the course of three months. That long period of time seems designed to guarantee that the entire group won't be wiped out in one cataclysmic event such as extreme weather. "Mine" tend to arrive back at my house in June although some southern parts of the state have reported arrivals as early as April. If I'm slow to get the feeders hung, one random morning I will look up from working at my desk here by the window and there will be a Ruby-throat hovering directly in front of me on the other side of the glass. Now try to tell me they don't remember exactly where they've been before! I've come to know that annoyed look, flick of the head, and the darting flight that says, I'm back now, so where's the food? Who wouldn't miss that and grow just a little melancholy when it all goes south for the winter. With the exception of the last two photos, all images are courtesy of Wikimedia Commons.